Gerardo Martino with Barcelona's defeat against Atletico, but is looking to bounce back quickly. 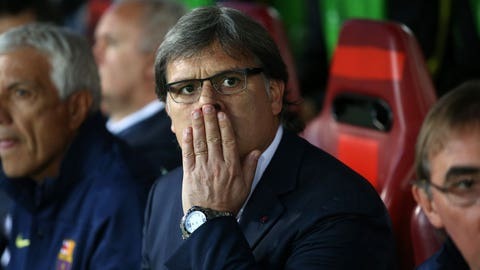 Barcelona coach Gerardo Martino conceded his team were punished for a slow start after their 1-0 defeat to Atletico Madrid in the Champions League quarter-final. Atletico reached the last four of Europe’s premier competition for the first time in 40 years thanks to Koke’s goal after just five minutes, which earned them a 2-1 aggregate victory in the tie. Martino said: "At the start, the game went like Atletico like it. They were playing direct and winning the second balls. It wasn’t that we lacked intensity, but we couldn’t put four or five passes together. "We expected to have more control of the ball to avoid their pressing, but we didn’t manage to do that. There was a big difference between the sides in the first 20 minutes, but after that both sides had their chances. "We feel bad, as we should feel in a competition where we had great expectations. 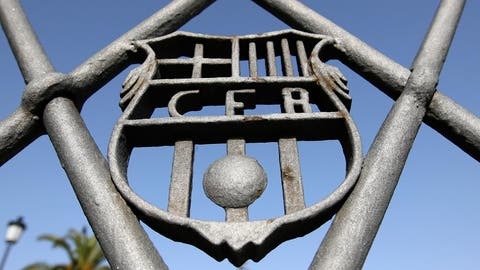 Now we have to grieve, I’ll talk to the players, probably Thursday, and we’ll move on. "There are different competitions and the good thing about this is that only 35 or 40 days ahead of the end of the season we have had chances on three fronts. "Are we going to assume if we don’t win on one of the three fronts that will have a decisive impact on the others? I don’t think so. These kids are really used to it." Barca have still not managed to beat Atletico in five meetings this season, and talisman Lionel Messi has not scored against the Madrid side in any of those games. However, Martino insisted Barca cannot always depend on his compatriot to unlock defences, as the team possesses threats from Neymar, Andres Iniesta, Cesc Fabregas and Dani Alves. Martino added: "We weren’t interested in Messi participating as much in the build-up play as normal, as we wanted to isolate him for one-on-ones on the right due to the way Atletico defend the space in the middle. "Ironically, he had two chances coming more into the centre from crosses by Dani and Neymar, but we don’t base everything solely on Leo. "There is Cesc, Andres, Neymar, the full-backs. When we win, lose or draw, we do so as a team."